Nationwide study shows Bristol taking top spot from London, but the future is bright for the rest of the UK. The UK’s biggest urban areas are embracing smart city technology at a faster rate than ever, new research has claimed. The latest Huawei UK Smart Cities Index has revealed how many of the nation’s biggest cities are using new technology across a wide range of areas. The Index, carried out by Huawei UK and Navigant, and revealed at a launch event in London today, found that Bristol has snuck ahead of the capital to become the “smartest city”, but that the rate of innovation was at an all-time high across the nation. 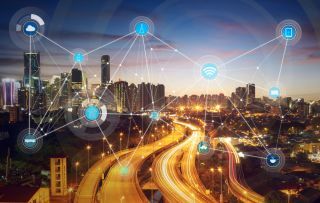 Looking at 20 cities across the UK and their smart city strategies, the Index named Bristol and London as “leaders” in terms of their progress, signifying that the two areas are utilising technology faster and more effectively than others. Bristol was praised for its whole-hearted move into connected technology, particularly through the Bristol is Open project, which has helped to spearhead new initiatives, including a new City Operations Centre to act as a hub for effective rollouts. London was highlighted for moving forward on several major new projects, including the Digital Greenwich programme, which should act as a hotbed for breakthrough technologies, as well as appointing a chief digital officer to head up other new initiatives. However the report said that the two leaders should not rest on their laurels, as they were followed by 12 “contender” cities, including the likes of Birmingham, Manchester, Milton Keynes and Cambridge, all of which were hailed for their increasing use of smart city technology.